-Saturday, September 9 at 11:00 am: ATW's Lunch & Learn series resumes with Wayne Rhodes, Good Water Master Naturalist. -Saturday, October 7: WildFest 2017. See the article below for more information. 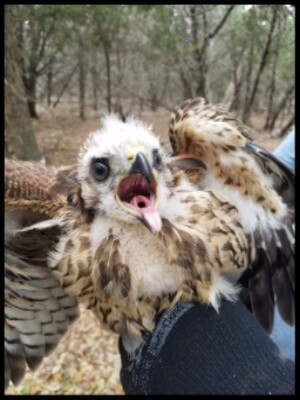 -Saturday-Sunday, February 3-4, 2018: ATW will host the International Wildlife Rehabilitation Council's Basic Wildlife Rehabilitation Course in Georgetown. Stay tuned for registration information. Most of the wild animals in rehabilitation are now juveniles, but that doesn't mean their needs are any less. The animals need fresh food, caging, and continued medical care, including vaccinations. You can help by donating needed supplies listed on our Amazon Wishlist or by donating to ATW through PayPal. You do not need a PayPal account to donate. Elizabeth C. is rehabilitating 12 cottontails. Leanne D. released 2 opossums and transferred a blue jay nestling raised to fledgling and a mockingbird nestling raised to fledgling to another rehabilitator. She is rehabilitating 4 baby foxes, 4 baby raccoons, a baby opossum, and a fawn that was found near death, but is now doing great. She is sending a prairie dog to live in the new prairie dog colony at the Austin Zoo. Kim F. released 4 opossums in May. 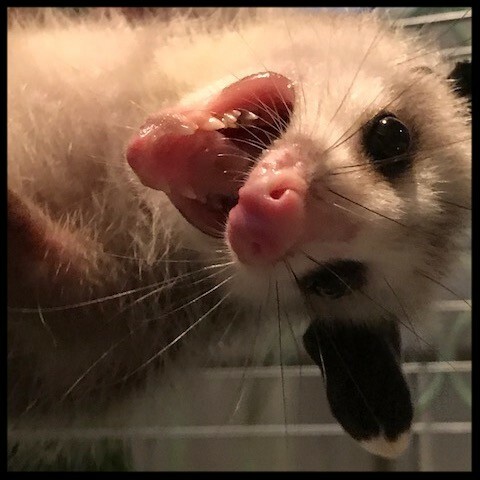 She is rehabilitating 3 juvenile opossums and has helped transport several animals to other rehabilitators including a baby skunk and 5 baby opossums. Natalie H. released 33 opossums, 9 of which include the mama opossum that had surgery to fix a broken leg and her 8 babies. She also released a blue jay, an Inca dove, a sparrow, 2 raccoons, and 3 squirrels. She is currently rehabilitating a scissor-tail flycatcher, a mourning dove, a raccoon, 4 fawns, and 4 skunks. She is also caring for 11 foxes. Alissa K. is currently rehabilitating 2 rats and a baby squirrel. She also helped care for baby squirrels before sending them to another rehabilitator to get ready for release. 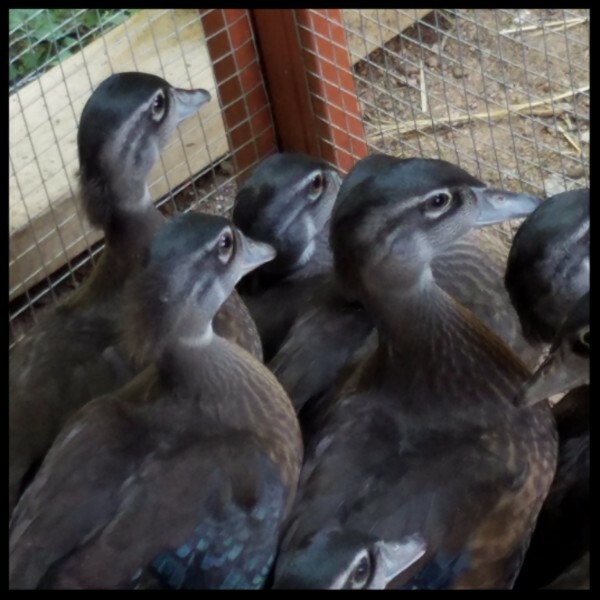 Shannon L. took in several birds that she raised until they were ready to join other birds in another rehabilitator's aviary. Helen L. has been rehabilitating 53 baby opossums, 14 baby skunks, 2 squirrels, and 6 rats. Her house has also become an intake center of sorts! She took in 64 birds, most of which went to Shannon L. and Janet P. The 11 raccoons she took in went to Karen O. and Brooke W. Most of the 17 rabbits that came in were sent to Elizabeth C. Lissy M. took the 2 ducks and Natalie took the 3 fox kits. Helen also took in a fawn and a badly injured turtle. 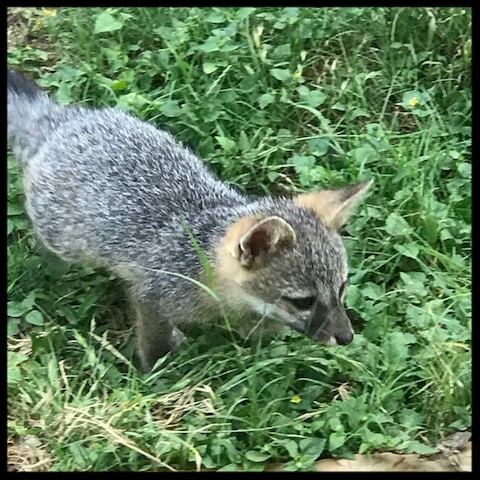 Karen O. continues to take in baby raccoons and is now up to 29! She is also rehabilitating 2 coyote pups, 9 fox kits, and 14 opossums. She transferred 6 foxes, 4 skunks, and 2 doves to other rehabilitators. Janet P. has had a busy couple of months! She has rehabilitated and released a titmouse, 2 cowbirds, 2 killdeer, 2 robins, 3 finches, 3 purple martins, 3 grackles, 3 mockingbirds, 6 sparrows, 6 starlings, 8 blue jays and 16 doves. Brooke W. is rehabilitating 2 fawns and 12 baby raccoons. Donate to help the wild animals now! April 1: Sharon B. and Karen O. represented ATW at the 6th Annual Texas VegFest. They taught scores of people about opossums and what ATW does for the community. May 18: Cynthia Sperry taught us about the many birds we may see in our gardens and how to make our backyards more welcoming to our feathered friends. June 10: Karen O. successfully trained over twenty new volunteers at the Capture & Transport Training! Thank you to everyone who came out! 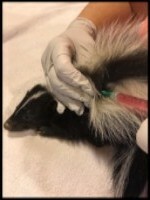 ATW rehabilitators will be vaccinating their rabies-vector animals, such as raccoons, foxes, and skunks, against rabies and distemper prior to release. Whereas in the past, many of our rehabilitators vaccinated raccoons at their own expense, ATW is now able to support the effort for all the rehabilitated rabies-vector animals. As you can see from the above statistics, the primary mammals testing positive for rabies in Central Texas are bats. Although the animals released by ATW represent a tiny percentage of the population of that species in the wild, we can never be careful enough to ensure that our released animals are healthy and not vulnerable to rabies, a disease that can be transmitted to other animals and humans. If you see an animal that is exhibiting abnormal behavior, such as being out in the daytime with stumbling, vocalizing, drooling, having seizures or being aggressive, you should report it immediately to Animal Control. Often, the same symptoms can be caused by distemper, a disease that is not contagious to humans. In conclusion, we would like to give the badly misunderstood opossums a much-needed plug. One of their defense displays is drooling. This does not mean that the opossum has rabies because opossums do not carry rabies. Save the Date and Save Their Fate at the 1st Annual WildFest 2017! The purpose of WildFest 2017 is to educate the community, especially children, about respecting and protecting all wildlife and their habitats—while having FUN! This is a free, family-friendly event with lots of fun activities, arts and craft projects, and opportunities to meet animal ambassadors and wildlife rehabilitators! If you would like more info or if you would like to volunteer to help at WildFest - fantastic! Please contact the Event Coordinator, Ginger Magnuson, at wildfest2017@gmail.com or text her at 512-230-8777. We are also looking for sponsors for the event. Click here for more information on becoming a sponsor. After the summer break, ATW's monthly Lunch & Learn series will resume in September. We have a four more educational talks planned for the end of the year. The Lunch & Learn events are held at Reale's Italian Cafe on the second Saturday of the month from 11 am-1 pm. Lunch is at your expense. If you are interested in attending, please email us at allthingswildrehab@gmail.com because space is limited. Thank you! Our Instagram account was hacked and deleted in June. Instagram does not backup accounts so once they are deleted, they are gone forever. Please follow us again. Our profile name is allthingswildrehab. Thanks! All Things Wild Rehabilitation, Inc., is a nonprofit, tax-exempt public charity under Section 501(c)(3) of the Internal Revenue Code. Tax ID number is 46-1309620. Donations to All Things Wild Rehabilitation are tax-deductible as allowed by the Internal Revenue Code.